Mike and Mary's daughter, Jenny Andrew, and her family left Beausejour, MB in 1986, when the base closed, and moved to Cold Lake, AB. They resided there until Ken's retirement from the Canadian Armed Forces in 1991. They moved to Edmonton where they still reside. Ken works for Stamco Specialty Tool in Edmonton as shipper receiver. Jenny works as a nursing attendant for Capital Care, Lynnwood, where she looks after Senior Citizens. Their eldest daughter, Tanya, graduated from Grant McEwan Community College in Early Childhood Development in 1992. 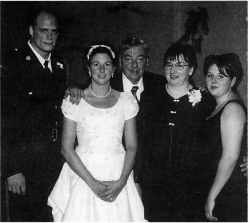 Tanya married Dwayne Welfl on September4, 1999. They reside in Calgary where Dwayne is a city policeman and Tanya works for Carradon Windows and Doors. Krista completed her high school at Jasper Place High School. She is preparing to graduate from the Natural Resource Technician Program at Lakeland College in Vermillion, AB. Mary took sick in 1993 and, in 1995, became too sick to care for her husband. Mike entered Third Crossing Manor in Gladstone, MB. Mary succumbed to cancer on January 2, 1996. She was buried in Sacred Heart Ukrainian Catholic Cemetery. Mike lived in Gladstone until his pass­ ing on May 21, 1999. He was buried in Erickson beside his wife. and fashion show of wedding dresses, Thru The Years. Viola's mother-in-law's, her daughter's and her own wedding dress were all modelled that night. Viola will always be remembered for tapping her toe in time to the music when conducting a choir. When, at 80 plus years of age, she climbed up on a table to direct the choir at the Ecumenical Church Service, it was a climatic and some­ what anxious moment for those attending the service. She spent the fall of 1985 and winter of 1986 living in Esterhazy, SK. In those few months she was quickly recognized as a 'Master Quilter' and made many new friends as she contributed her expertise to help them make quilts. 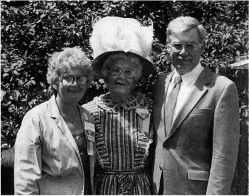 In May 1986 she returned to Erickson, where her heart was and happily lived in her own home there. In January 1990 she moved to Parkland Home. The follow­ ing month she had a severe heart attack and spent much of the remaining year in Erickson Hospital. In November 1990, she moved into a Care Home Respite Room, which she made her home until her death on April 24, 1991. Ron and Sheila Miller - If everyone owning Earest, 1o.Ei.cl.d. Volume 1, has pernsed and enjoyed their copy as much as our family has, the book has surely fulfilled the dreams of the History Book Committee. Thank you to the new History Book Committee for your vision and this opportunity to update and record our family history. Since their marriage on October 7, 1959, Ron and Sheila have made their home in Hamiota, MB, 1959-60; Brandon, MB, 1960-67; Killarney, MB, 1967-68; Esterhazy, SK, 1968-71; Lanigan, SK, 1971-74; Esterhazy, SK, 1974-98; and their lives have been enriched by the last­ ing friendships made at each locality. Their three children think of Ester hazy as home but the Miller roots in Erickson will always be a 'constant' in their lives.